Non-Stick Plank Flexi Basket | Patio and Hearth Co. Turn and move your plank-cooked meal on the grill with one motion! 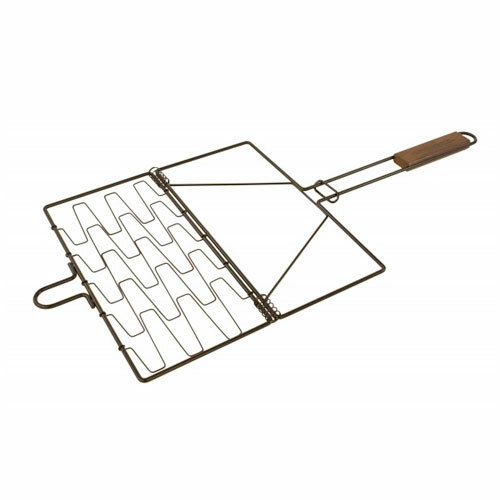 With this flexible grilling basket, you can place any cut of meat (or even several) inside with a wood plank, and easily maneuver it over your grill. You can even flip the whole thing upside-down to give the top of your food a finishing touch over the flame. This basket is perfectly shaped to hold a standard 5″ x 12″ wood plank. The interlocking non-stick links on the sides of the basket expand to securely hold food. It can be used on charcoal, gas, or electric grills. Inquire about Non-Stick Plank Flexi Basket using the form below.